I’m home after a very, very fabulous and exciting nearly 3 weeks in China. It is the first day of Spring today and the weather has been lovely and sunny and there is blossom on my neighbour’s tree and everything is looking very good.It is quite significant that I am home to see the blossom as I have been starting to learn Chinese while I have been there and the Chinese name for England starts with the word Ying which means blossom (the Chinese use similar sounding words for foreign names). My name in Chinese translates as ‘a beautiful forest’ because ‘A’ ‘Li’ ‘Son’ relates to those 3 characters. I think that is a lovely name, especially as I love being outdoors so much. 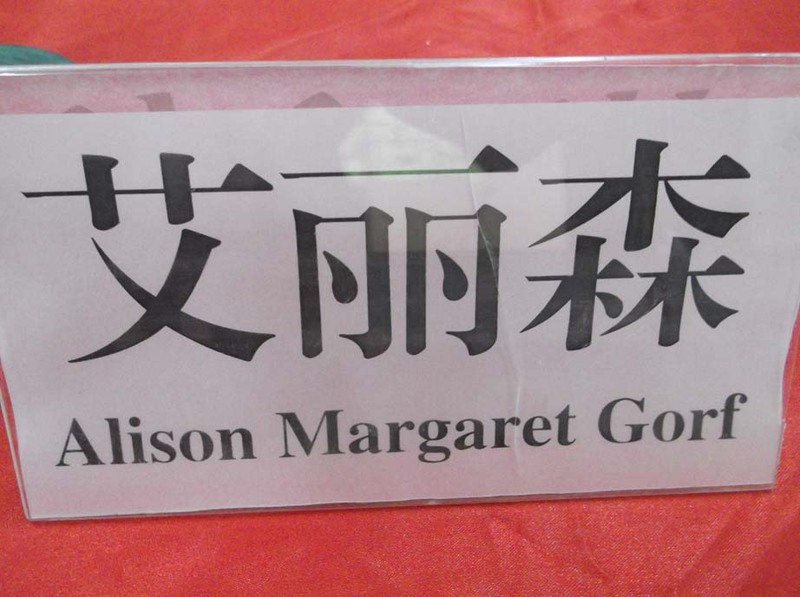 Here is my first name on my name plate from the first group I taught. I am still feeling a little disorientated due to the time difference – it took 22 hours to get home yesterday and my sleep patterns are still very disrupted and I keep waking up and forgetting where I am!I am also very tired as I have been working very hard while I was there with at least 12 – 14 hour days. However it was brilliant fun. I met so many lovely people and was looked after really well. The food was wonderful and I got to see quite a bit of the country and some of the historic sites despite only having 3 days not teaching out of 20 days there. I am sorting out the 1,000 plus pictures I took while I was there so that I can create a web page about the trip but meanwhile I have included a pic for this post. 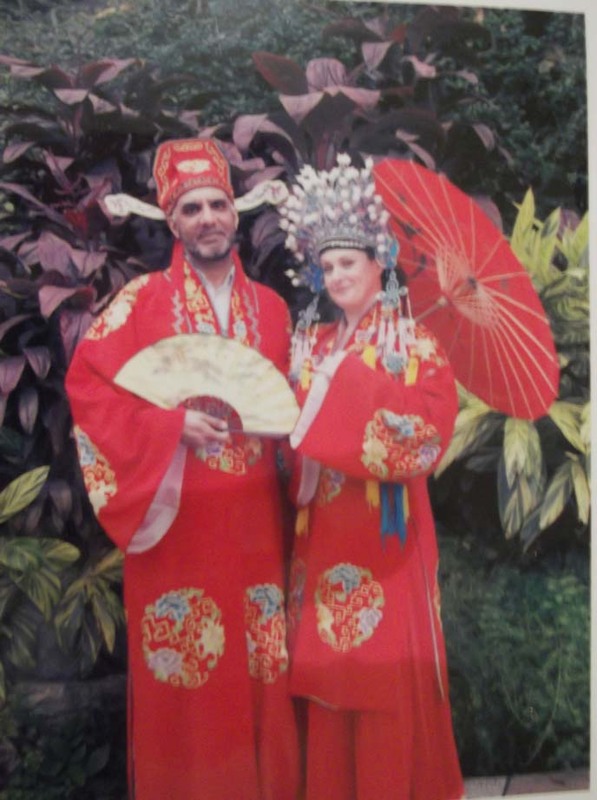 Apologies for the quality of this as it is a picture of a digital photo that we had taken in the Yuexie park which we visited on one of our rest days. They had a stall where you could hire costumes and have photos taken so this is me and my colleague Mo dressed as a Chinese Emperor and Empress. We chose this costume as I had been treated so well in the first week I was there I felt like royalty and my other colleague Chris had joked that it was because I was princess. It was great fun dressing up and we certainly amused the people in the park, there was a huge crowd watching our photo shoot! I will be back later in the week with more updates, in the meantime sleep is calling!